Carrickalinga is a popular holiday retreat for tourists far and wide, many attracted by its white sandy beach, crystal clear waters, rock pools and great views over Roma Mitchell Bay and Yankalilla Bay. 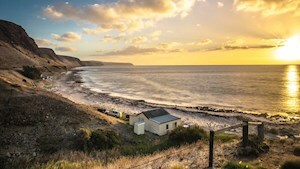 One of the best ways to appreciate the beauty of this coastal village is to take the shared walking track and bike trail to Normanville. The best approach is from the north via Myponga Reservoir to enjoy the dramatic coastal views. For more great views, make sure you stop at the lookout on Forktree Road. Carrickalinga was named South Australia's top beach by Lonely Planet in 2013. See what people are posting about Carrickalinga.